When my husband found the Happy Saints blog, he sent me the link, saying, “You gotta check this out.” Like him, I fell in love with the super cute pictures of various saints and the brief descriptions of the saints’ works. 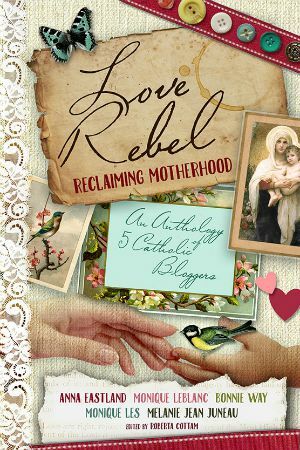 We’d been discussing how to teach our daughters more about the saints of the Church and this was a perfect resource. Then my husband saw the ebook. “You need to review that,” he said. So I am. 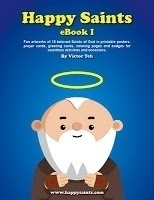 Happy Saints eBook I contains fun artworks of 15 beloved saints of God in printable posters, prayer cards, greeting cards, coloring pages and badges for countless activities and occasions. Some of the saints featured in this ebook are St. Alphonsus Liguori, St. Augustine (a doctor of the church), St. Francis of Assissi, St. Fancis Xavier, St. Ignatius of Loyola (founder of the Jesuits), Blessed Pope John Paul II, Saint Teresa of Calcutta, and St. Therese of Lisieux. As I browsed the book, I found myself smiling. It was a good thing my Netbook wasn’t hooked up to the printer, or I would have promptly printed off most of the posters. They are gorgeous. Each features a picture of the saint, along with a brief quote from that saint around his or her picture. Then there’s a brief biography of the saint, detaining when they lived and when their feast day is. Finally, there is a brief prayer that helps us apply a lesson from the saint’s life to our own lives. As someone who enjoys writing letters, the cards also caught my eye. Each card has a picture of the saint on the cover with a brief quote from that saint. On the back of the card is the saint’s biography, leaving you room to write inside the card. These cards would be perfect for a variety of occasions. For example, the card for St. Francis of Assissi simply says, “It is in giving that we receive.” What a great thank-you card! St. Monica’s card says, “I wish for you to be a child of Heaven,” which could be used for birthdays or baptisms or other celebrations. I’ll definitely be turning to these next time I need to send someone a card. Finally, at the end of the ebook are the colouring pages. All the cute pictures of the saints are drawn in black and white for a child to fill in the colour. My girls love colouring, but they also like talking about what they are colouring—giving me a perfect chance to teach them something while they are playing (as long as I know enough about the saint myself to answer their questions!). If you drop by the blog, scroll down the right side for a list of saints. Some of my favourite saints include St. Gerard Majella (patron saint of expectant mothers) and St. Margaret of Scotland (I wrote a paper about her husband in university). On the blog, you’ll find the saint’s picture and biography, along with a link to Wikipedia if you want to know more about the saint. Obviously, there are so many more resources available in the eBooks. If you like this eBook, there is also Happy Saints eBook II (check it out to download a FREE St. Nicholas prayer card!) and Happy Saints Christmas Story eBook. All three eBooks are currently 10% off. You can also find Happy Saints on Facebook and purchase gift coupons for the eBooks. I’m linking up with Grace-Laced Mondays and Life in the Comments. I own happy saints books I, II and the christmas e book. I love them!! They versatile and easy to use. We made refridgerator magnets from the badges and framed some for our school room walls. My kids are so happy with these images! Thanks for this book review. 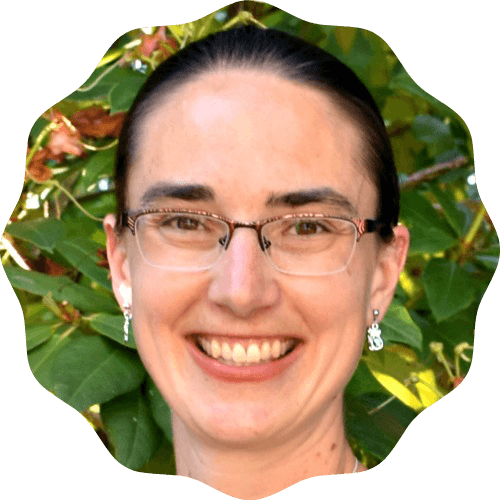 Sounds like an interesting read and resource, Bonnie!